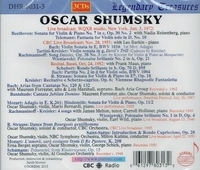 "Oscar Shumsky, a violinist and conductor who was renowned for the beauty of his sound and the luminous musicality of his performances of Bach, Mozart and Brahms, was one of the last students of Leopold Auer, the legendary Russian violinist who also taught Jascha Heifetz, Mischa Elman and Efrem Zimbalist. When Auer died in 1930, Zimbalist took over Shumsky's training and reinforced the grandly Romantic, communicative interpretive style that was the principal hallmark of the early 20th-century Russian violin school. Although he never became a household name on the order of Heifetz, he commanded tremendous respect among musicians throughout his career, not only for his solo performances but also for the passion he brought to chamber music and orchestral playing. That quality was something he passed on to many of his students, who included Eugene Drucker and Philip Setzer of the Emerson String Quartet; Ida Kavafian; Eliot Chapo, a former concertmaster with the New York Philharmonic and Guillermo Figueroa, the concertmaster of the New York City Ballet Orchestra. In the 1950s, he began playing the viola both in chamber performances and in recitals, and he often included unaccompanied works for both instruments on his programs. He also took up conducting in the 1950s, and made his podium d�but in Canada, with the National Festival Orchestra in 1959. Other orchestras he conducted over the years include the Westchester Symphony, the San Francisco Symphony and the Mostly Mozart Orchestra. By the 1970s, Mr. Shumsky's performing schedule had dwindled as a taste for modern, streamlined interpretations eclipsed the Romantic style in which he specialized. Nevertheless, he became a revered teacher on the faculties of the Juilliard School, the Curtis Institute and Yale University." 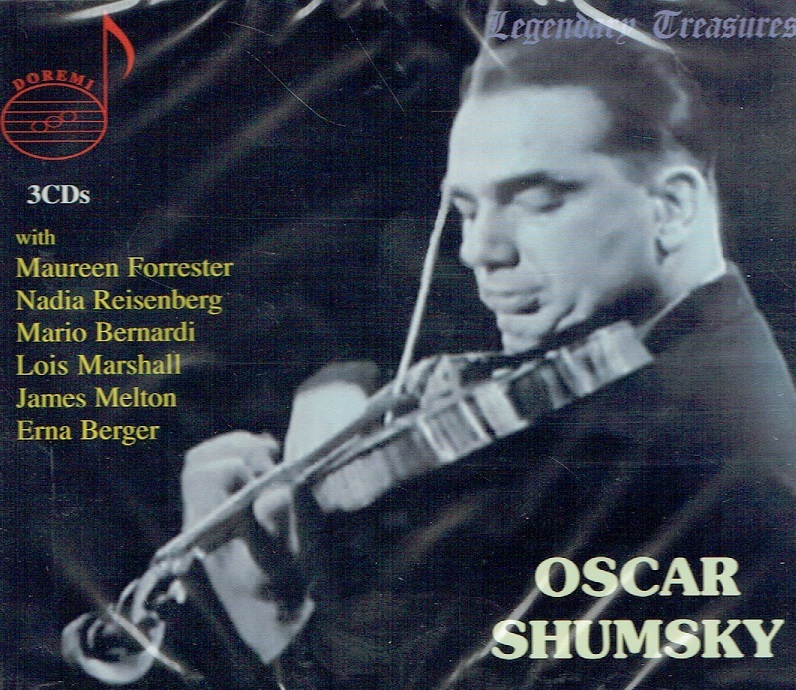 "The American violinist Oscar Shumsky was regarded by many musicians as one of the greatest 20th-century exponents of his instrument. His intensely communicative yet refined playing combined the grand romantic tradition of Russian-Jewish violinists with the same dash of eloquence that characterised the playing of his idol, Fritz Kreisler. His immaculate technical command was legendary, and his lyrical playing was distinguished by a luscious warmth and highly expressive intonation. His musical memory was staggering; he could play entire passages of an orchestral score on the violin. Born to Russian immigrant parents in Philadelphia, Shumsky began studying the violin at the age of three. His outstanding talent was recognised early, and, in an era of such remarkable prodigies as Yehudi Menuhin, Ruggiero Ricci and Guila Bustabo, he held his own. After playing to Leopold Stokowski, the conductor pronounced the young violinist - the most astounding genius I have ever heard - and, in 1925, invited Shumsky to appear as soloist with the Philadelphia Orchestra in Mozart's Violin Concerto #5 in A major. Later that year, Shumsky began studying privately in New York with the renowned violin pedagogue Leopold Auer, who had taught Heifetz, Elman, Milstein and Efrem Zimbalist. In the autumn of 1925, Shumsky enrolled at the Curtis Institute of Music in his home town, where he joined Auer's violin class. After Auer's death in 1930, he continued his studies at Curtis with Zimbalist In 1939, Shumsky was personally invited by Arturo Toscanini to join the newly-formed NBC Symphony, where he remained for two years. At the same time, the great viola-player William Primrose asked him to lead the Primrose Quartet as first violin (with Josef Gingold as second violin and Harvey Shapiro on the cello). To this day, the quartet's commercial recordings of Haydn, Schumann, Brahms and Smetana are prized by connoisseurs of chamber music. After serving in the US navy during the second world war, Shumsky resumed his concert career as a soloist. He was also in great demand for studio work, and often led the RCA Victor Symphony and Columbia Symphony orchestras. Later, he was appointed as solo violinist for the NBC network in New York. During this golden age of American radio, he was featured weekly as soloist in radio broadcasts, often accompanied by Earl Wild at the piano. In 1959, he became co-director, with the pianist Glenn Gould, of the Stratford festival in Canada. They performed frequently in duo sonatas, and were often joined by the cellist Leonard Rose in trios. During these years, Shumsky began performing on the viola as well, and began to conduct. He also established himself as a superb teacher at the Curtis, Juilliard and Peabody conservatoires, as well as at Yale University. His students included Steven Staryk, Elliot Chapo, Ida Kavafian, Eugene Drucker and Philip Setzer, the last two members of the Emerson Quartet. His recorded legacy includes the unaccompanied sonatas by Bach and Ysa�e, concertos by Bach, Mozart, Beethoven and Glazunov, the complete Mozart violin sonatas (with Artur Balsam) and sonatas by Brahms, Grieg, Dohnanyi and Leo Weiner. He also made several discs of short pieces by Kreisler and the complete Brahms Hungarian Dances. Apart from music, he had a keen interest in woodworking and a passion for photography. As a musician, Shumsky was intensely focused. He was intolerant of showmanship; for him, music was not entertainment, and he abhorred the showbiz antics that characterised many musical performances in the late 20th century. His artistic demands could sometimes intimidate colleagues and students, and his uncompromising attitude would occasionally work to his disadvantage. Fortunately, in the autumn of his career, Shumsky was rewarded by a renewed interest in his artistry. In the early 1980s, he resumed giving concerts after an absence of over 45 years. His appearances throughout Britain and continental Europe were an overwhelming success, prompting the London-based critic Dominic Gill to proclaim the most memorable musical events of 1982 as appearances by Horowitz, Michelangeli and Shumsky. 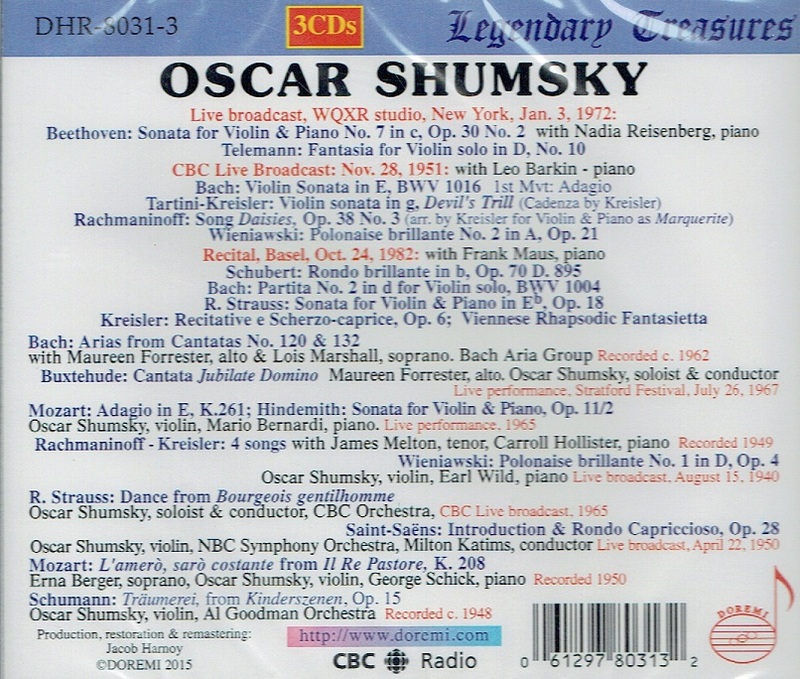 Although he never became a household name like Heifetz or Perlman, Oscar Shumsky was the quintessential 'violinist's violinist'. As Eugene Drucker remarked: 'I will never forget his uncompromising personal integrity, his continual quest for musical substance rather than surface gesture, his encyclopaedic knowledge of the violin repertoire and his magnificent command of the instrument. There will never be another like him'."